I used to have a lot of respect for Thomas Sowell. I didn’t agree with him but I felt he was consistent with the framework of his economic argument. My social media feed has been directing me to articles Sowell wrote for the National Review Online that speak to the unrest in Ferguson, Baltimore, and elsewhere over the past ten months. When I carefully read those articles, I don’t see argument based on conservative economic principles. What I see is distortion and misrepresentation of the circumstances on the ground in service of a dominant ideology. It seems that maintaining ideological purity in the face of difficult social situations requires cherry picking and reinterpreting circumstances. This saddens me for two reasons: it fails to advance needed conversations as a society and it shows what extreme partisanship does to academics. 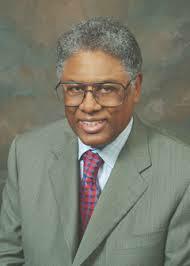 The positions Sowell espouses are supported by some isolated statistics which gives them the air of academic strength. But they are far too careless with details, as just a little research would show. Consider the article titled The “Disparate Impact” Racket written in March after the Department of Justice released their reports on Ferguson. The first report showed that there was no evidence that Michael Brown had been shot in the back or had his hands raised when shot. While that report didn’t “clear” Darren Wilson, it did show that original eyewitness testimony had been wrong (and there has been interesting commentary from social psychologists why this happens in bystander testimony). If you know a little about criminal justice, this isn’t surprising. The bottom line is that all this hard evidence, and more, shows what a complete lie was behind all the stories of Michael Brown’s being shot in the back or while raising his hands in surrender. Yet that lie was repeated, and dramatized in demonstrations and riots, from coast to coast, as well as in the media and even in the halls of Congress. Sowell’s choice of the word LIE acribes something duplicitous in those concerned with the shooting. It also detracts the reader’s attention from the tragedy of the shooting to the “hands up don’t shoot” claim. As if finding that the latter was false means that the former is as well. The second report from the Department of Justice was about the actions of the Ferguson authorities in terms of “disparate intent” — the ways that traffic stops and minor arrests were a source of the frustrations underlying the protests in Ferguson. Like many other uses of “disparate impact” statistics, the Justice Department’s evidence against the Ferguson police department consists of numbers showing that the percentage of people stopped by police or fined in court who are black is larger than the percentage of blacks in the local population. The implicit assumption is that without “discriminatory intent,” these statistics would reflect the percentages of people in the population. But no matter how plausible that outcome might seem on the surface, it is seldom found in real life, and those who use this standard are seldom, if ever, asked to produce hard evidence that it is factually correct, as distinct from politically correct. The DOJ report focused on the ways in which Ferguson used traffic stops, warrants, and fines to operate the city budget. This relied disproportionately on those who had the most difficulty making it to court, paying fines, keeping their car up to date on license and inspections. Sowell’s use of air quotes around disparate impact serves to minimize and even ridicule the claims. While on the road this weekend, we listened to a Ferguson town hall meeting hosted by NPR’s Michel Martin two weeks after the Brown shooting. It was clear from the comments and questions that three issues were central to the audience: disparate impact, leaving Brown’s body on the ground for 4.5 hours, and why the mayor didn’t take responsibility for the escalation from law enforcement (which, he claimed, was not from Ferguson officers). I don’t expect Sowell to adopt an anti-Ferguson demeanor or start attaching #blacklivesmatter to every tweet. But I think it is reasonable to expect him to deal with the substance of the issues in Ferguson and not dismiss them. You can still make your claims about cultural impact without denying structural factors. Again, to represent issues in Baltimore as riots and not protests (followed by vandalism) is to mis-tell the story. And it’s not clear how the Brown shooting was related or that everything was about the act of shooting. The issues remain about ongoing structural discrimination. To sustain this argument, we need to ignore all of the post-Baltimore stories that focused on covenant agreements in 1910 up to subprime loans in 2005. The structural discrimination concern isn’t about feeling bad over slavery but about ongoing issues in the fabric of society itself. We need to ignore the data suggesting that blacks paid $16,000 more than whites for equivalent mortgages during the housing crisis. Furthermore, to blame the welfare state as an alternative to institutional racism requires a standard slight of hand move: that racism existed in past days but the welfare state was expected to fix this. I don’t know why this is a standard conservative pundit move. As a sociologist, I expect that the injustices within the society will get written into the bureaucratic rules of our institutional structures. Therefore, the structural inequality evidenced in housing and criminal justice will also be evident in welfare and food stamp policies. A more robust vision of the forces we’re up against is necessary if we are to make progress. He goes on to argue that the Department of Justice “presume the police to be guilty…even after grand juries have gone over all the facts and acquitted the police.” First of all, he must be talking about Ferguson because there was a grand jury indictment in both Baltimore and South Carolina. Second, grand juries don’t acquit — they decide not to charge. It’s an important distinction. This isn’t nitpicking. It’s central to the argument. An academic, even writing in partisan press, has a responsibility for nuance and care in looking at the complexities involved. Public figures should play a role in illumining the key questions before us as a society. Racial demagoguery gains votes for politicians, money for race-hustling lawyers, and a combination of money, power, and notoriety for armies of professional activists, ideologues, and shakedown artists. In light of yesterday’s events in McKinney, Texas, we simply can’t afford such one-sided refusal to deal with real issues confronting us in racially contested society. It’s possible to argue that this “wasn’t about race” but only if you can ignore the sight of the police having African-American kids sit on the grass and be treated as suspects while everyone else milled around. To focus on the alleged wrongdoing of some does not excuse the behavior that followed — which brings us back to the source of the protest and media outrage. To be fair, I haven’t seen Sowell write anything yet about McKinney. But I’m not optimistic. It’s not about “the lie” that someone intentionally did something. It’s about the ways the aftermath illustrated that something is clearly wrong. Demagoguery only makes things worse. I thought you might be interested in this. It’s Vice News on Baltimore.